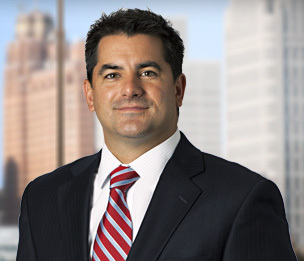 Brian M. Moore is a Bloomfield Hills based member of Dykema's Litigation Department. He has a multi-faceted commercial and business litigation practice. Mr. Moore's primary emphasis is in the area of commercial real estate, financial services, energy, business/shareholder and antitrust litigation. He also represents clients in connection with internal and government investigations. Mr. Moore has achieved many successful outcomes, including trials and arbitrations, for national and international corporations in state, federal and appellate courts. He works closely with each client to understand their business, strategic and litigation objectives to implement a successful, cost-effective litigation outcome. Mr. Moore has been recognized as one of the "Top 50 Michigan Business Lawyers" as well as one of the "Top 100 Lawyers in Michigan" for two consecutive years (2016-17) by Michigan Super Lawyers. Representation of lenders, developers, owners and other interested parties in commercial real estate development and construction projects, including litigation concerning the Bloomfield Park Development, Dearborn Hyatt Hotel, Wolverine Country Club Subdivision, Troy Officentre, and Cedarbrook of Northville. Representation of larger retailer in real estate purchase agreement dispute. Representation of companies, shareholders, partners and other owners in general corporate disputes, shareholder disputes and disputes arising from mergers and acquisitions. Representation of wind farm developers/owners throughout the county in defense of nuisance lawsuits. Internal investigation for the audit committee of a Fortune 500 company. Representation of automotive suppliers in the Auto Parts Antitrust litigation and in connection with DOJ criminal investigation. Representation of financial institutions in connection with the United States Trustee’s investigation of Chapter 13 bankruptcy filings/practices. Representation of companies and individuals in fraud, tortious interference, conversion, and other business torts cases. Representation of companies and individuals in civil assault/battery and defamation cases, including an NFL football player and popular celebrity news website. Representation of top 4 accounting firm in accounting malpractice case. Representation of residential custom home builder in litigation and state administrative proceedings. Dismissal of lawsuit seeking to enjoin sale of commercial property (former Kmart store) following denial of immediate motion for temporary injunction. Cocca Acquisitions, LLC v. Troy Coolidge No. 15, LLC, Case No. EQCV070106 (Iowa District Court, Cerro Gordo County, September 21, 2016). Summary judgment for defendant lender in a lawsuit by borrower seeking to enjoin a pending foreclosure sale of commercial property based on various challenges to certain loan document assignments. JGMM Realty, LLC v. LBCMT 2007-C3 East Eight Mile Road, LLC, et al, Case No. 16-10633 (E.D. Mich. August 2, 2016); affirmed on appeal, JGMM Realty, LLC v. LNR Partners, et al, Case No. 16-2199 (6th Cir. July 14, 2017). Summary judgment for plaintiff lender on judicial foreclosure claim involving commercial property, notwithstanding state court receiver action. U.S. Bank National Association, as Trustee for the Registered Holders of CFCRE Commercial Mortgage Trust 2011-C2 Commercial Mortgage Pass-Through Certificate, Series 2011-C2 v. Dearborn Venture Capital, LLC and Sam Hamame, Case No. 14-13921 (E.D. Mich. March 31, 2016). Money judgment during trial for plaintiff lender in commercial real estate guaranty litigation. 5420 Beckley Road, LLC v. Minges Creek Mall, LLC, et al., Case No. 09-3782-CH (Calhoun County Circuit Court, 2011). Summary judgment for plaintiff lender in commercial real estate guaranty litigation. Wells Fargo Bank, N.A. v. MPC Investors, LLC, et al, 705 F.Supp.2d 728 (E.D. Mich. 2010). Summary judgment for plaintiff lender in commercial real estate guaranty litigation. Wells Fargo Bank, N.A. v. Burton, et al, Case No. 09-13901 (E.D. Mich. 2010). Summary judgment for oil company in tort claim arising out of 1973 automobile accident. Affirmed on appeal by the Sixth Circuit. Green v. BP Products of North America, Inc., 169 Fed. Appx. 951 (6th Cir. 2006). Defense verdict in negligence case. Minock v. Iellamo, Case No. 96-517543 (Oakland County Circuit Court, 2000).